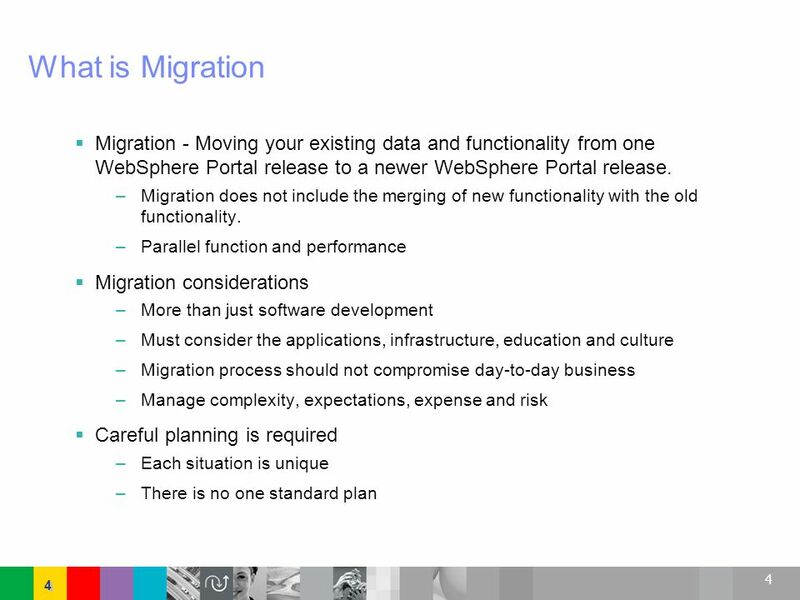 4 What is Migration Migration - Moving your existing data and functionality from one WebSphere Portal release to a newer WebSphere Portal release. 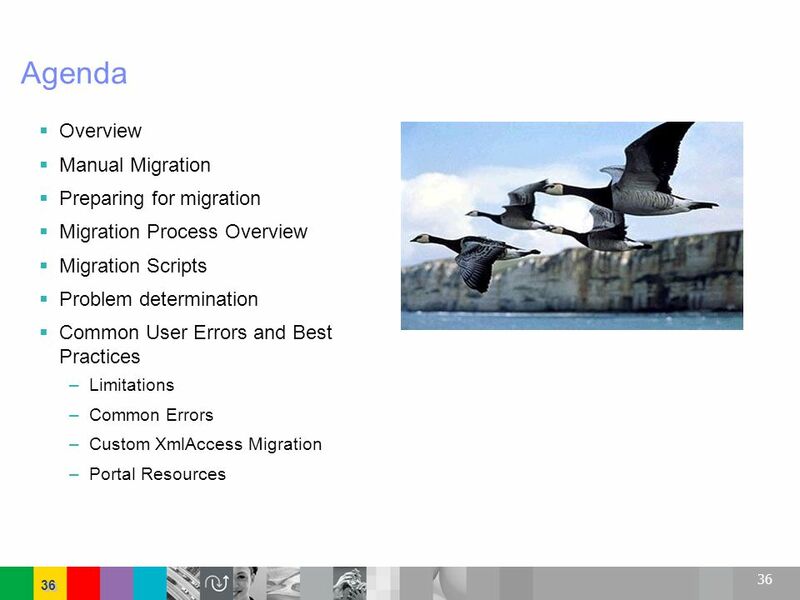 Migration does not include the merging of new functionality with the old functionality. 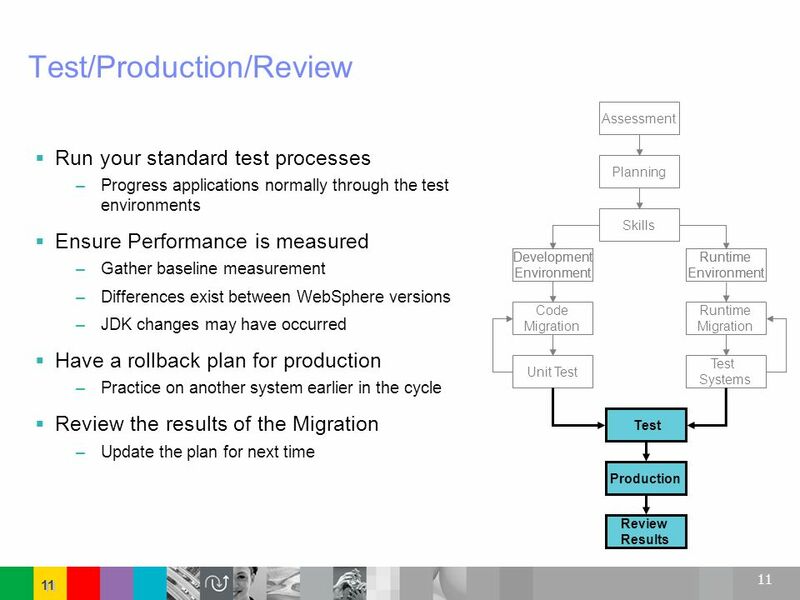 Parallel function and performance Migration considerations More than just software development Must consider the applications, infrastructure, education and culture Migration process should not compromise day-to-day business Manage complexity, expectations, expense and risk Careful planning is required Each situation is unique There is no one standard plan The point here is that there are many factors to consider when planning for a WebSphere Portal Server Migration. Different factors and participants will be involved in the Migration process and plan. You should account for all of these. Different perspectives Product architect( Design and features ) Developer( code changes ) Administrator( production runtime ) Technical support( capacity planning ) Development managers( resources and deadlines ) Executive management( cost, risk, impact ) Careful planning is required. Many of the customer successes or failures can be directly related to the strength (or even existence) of a comprehensive plan. 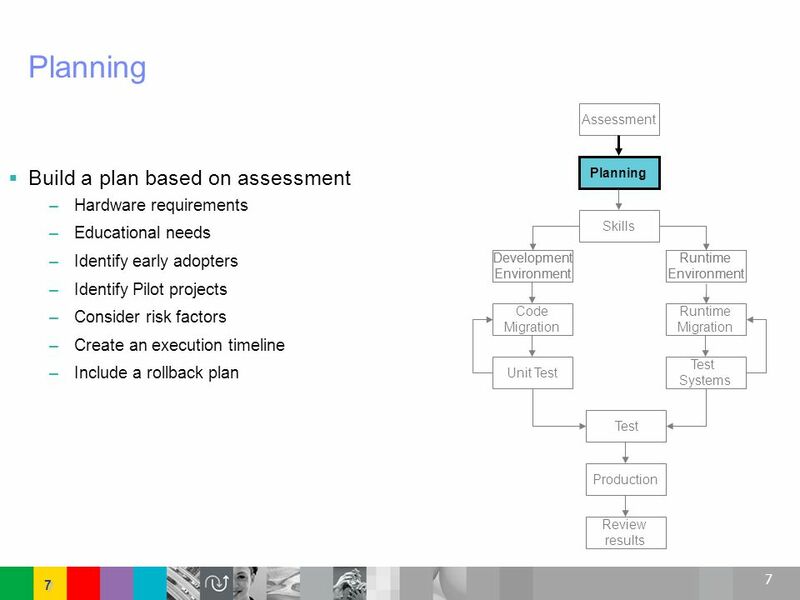 Many times Project Management becomes as important as the technical aspects when Migrating. 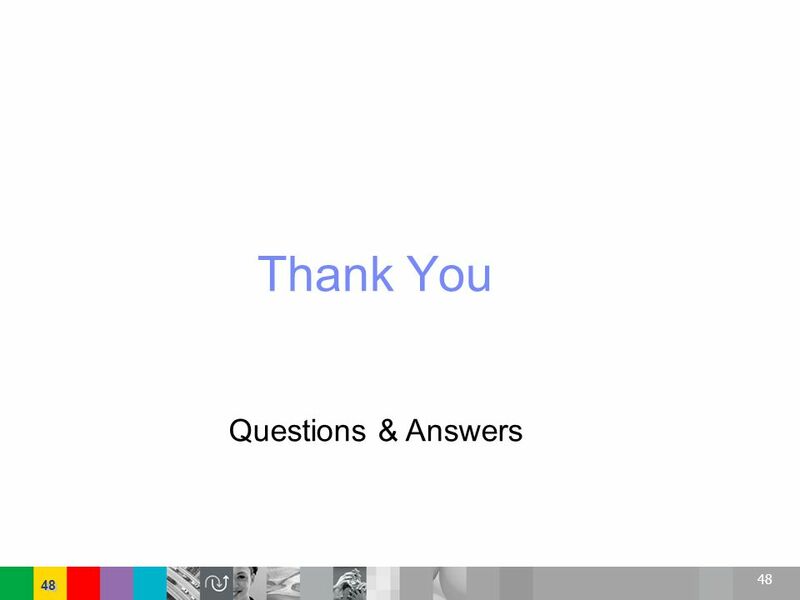 Each customer situation is unique based on the WebSphere Application Server version involved, use of 3rd party applications, previous Migration experiences: just to name a few. 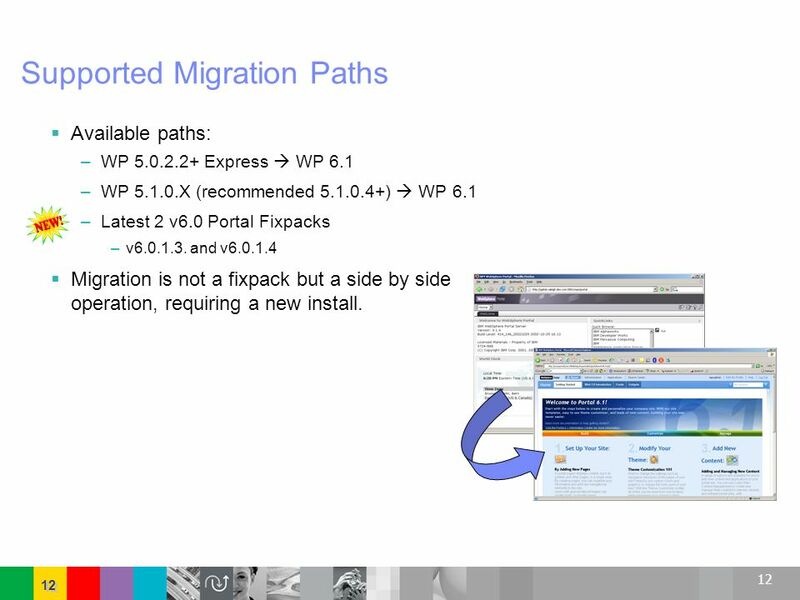 Available paths: WP Express  WP 6.1 WP X (recommended )  WP 6.1 Latest 2 v6.0 Portal Fixpacks v and v Migration is not a fixpack but a side by side operation, requiring a new install. Fixpacks use the Portal Update Installer to install fixpacks or individual fixes. Fixpacks apply file updates to an existing installation. The migration implementation is separate from fixpacks. Migration requires a new Portal installation and the tooling to transfer the configuration. 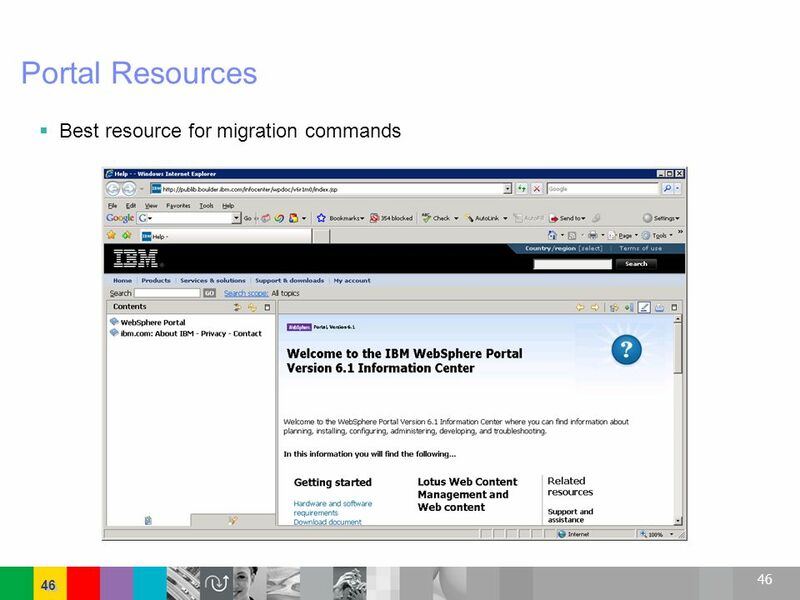 Migration scripts attempt to migrate the following resources WMM configuration – WMM attributes and associated database tables Client configuration - Configuration information for all clients that are supported by WebSphere Portal. 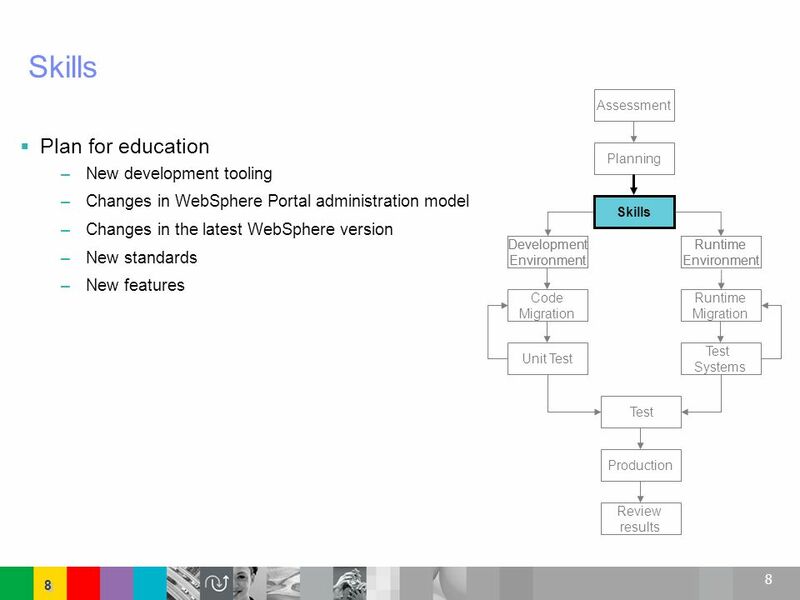 Themes and skins configuration - Configuration information for themes and skins for WebSphere Portal. Portlet Applications and portlets - Migration tasks are provided to facilitate deployment of the custom portlet applications. 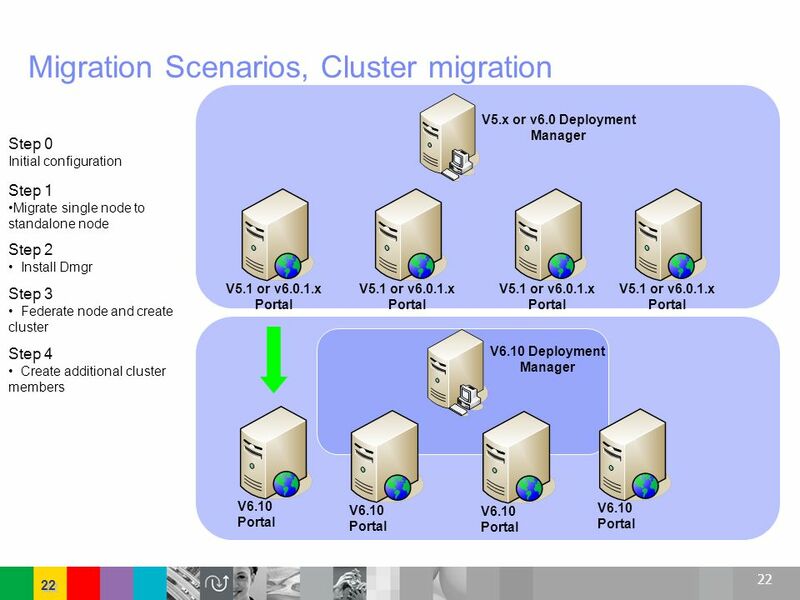 Portlet configurations – Customized portlet application configuration is migrated. Portal pages and places - The corresponding access control is migrated automatically with these artifacts. User customizations –these are customizable settings that are associated with portlet instances. 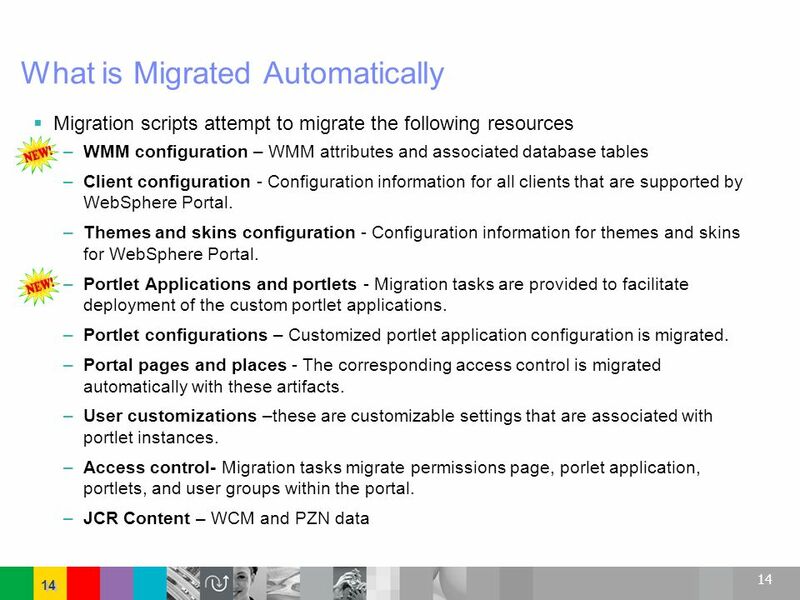 Access control- Migration tasks migrate permissions page, porlet application, portlets, and user groups within the portal. JCR Content – WCM and PZN data The path you choose for migration will depend on factors such as migration needs, time available, skills available, and existing resources. 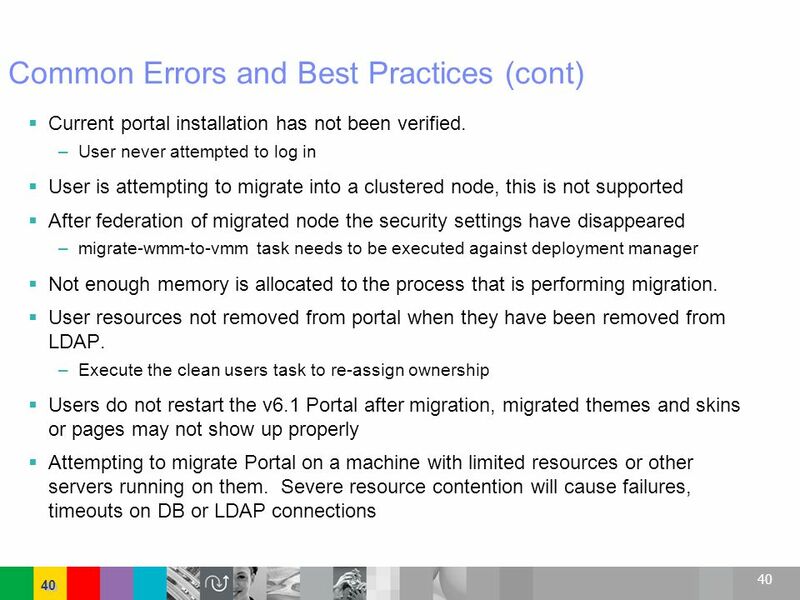 Do not cluster 6.1 Portal Federate after migration Validate Portal function Ensure login is possible Set the WAS and Portal admin ID and passwords to match those from the previous version Customizations to the v6.1 portal should be avoided, they will be removed or can cause problems during migration Start with fresh install Do not deploy portlets Do not create pages Do not change access control Do not delete pages Set up the new Portal to match the prior Portal configuration. 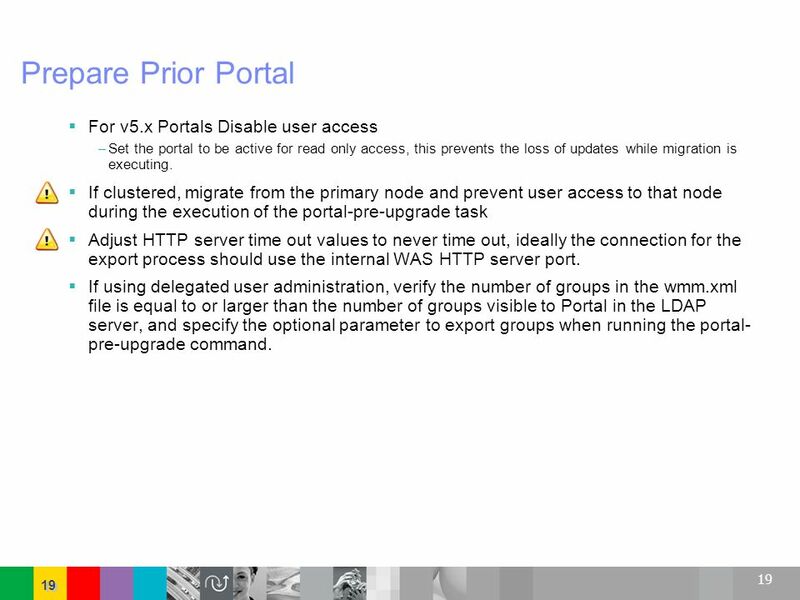 Set the portal to be active for read only access, this prevents the loss of updates while migration is executing. 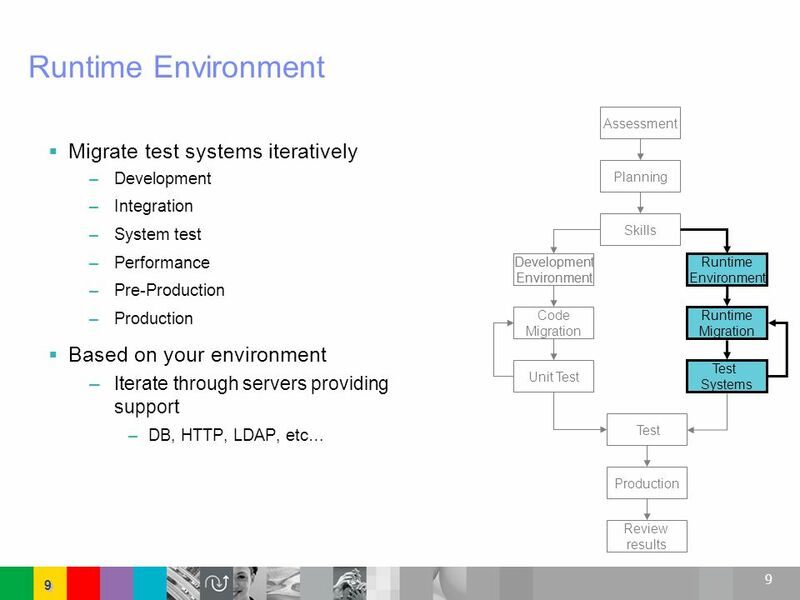 If clustered, migrate from the primary node and prevent user access to that node during the execution of the portal-pre-upgrade task Adjust HTTP server time out values to never time out, ideally the connection for the export process should use the internal WAS HTTP server port. If using delegated user administration, verify the number of groups in the wmm.xml file is equal to or larger than the number of groups visible to Portal in the LDAP server, and specify the optional parameter to export groups when running the portal-pre-upgrade command. Forgetting to copy the ‘wps.properties’ file into the migration directory is an easy step to miss. 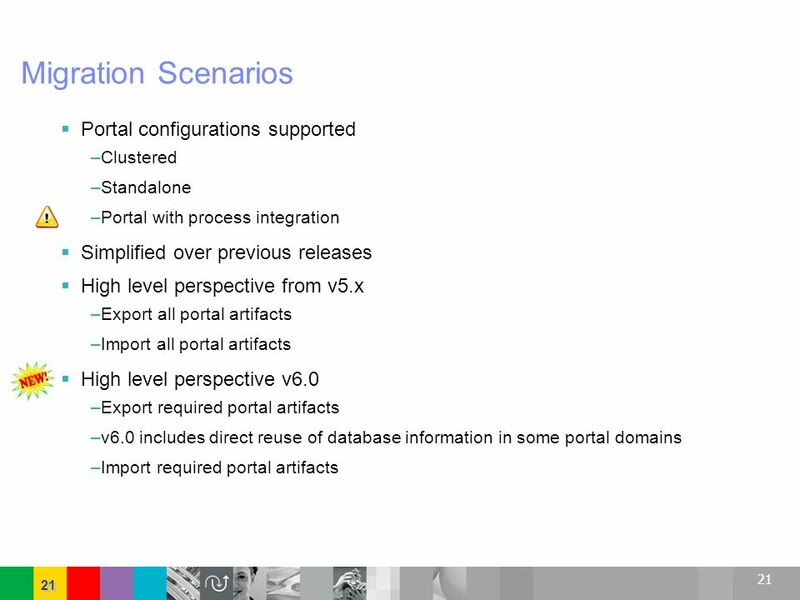 Clustered Standalone Portal with process integration Simplified over previous releases High level perspective from v5.x Export all portal artifacts Import all portal artifacts High level perspective v6.0 Export required portal artifacts v6.0 includes direct reuse of database information in some portal domains Import required portal artifacts The migrate-all tasks combine the Portal configuration pieces. Other components still require the component migration tasks. 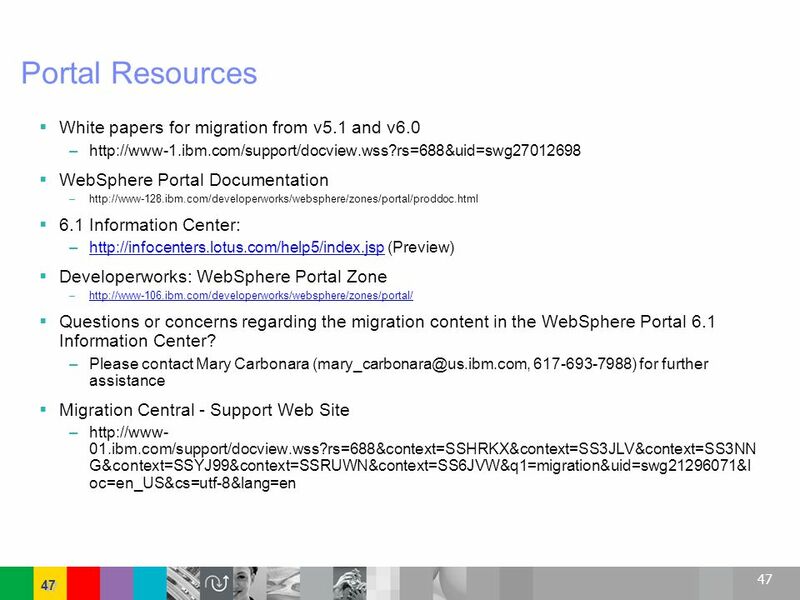 23 JCR Data Migration Document Manager is no longer available in WebSphere Portal. 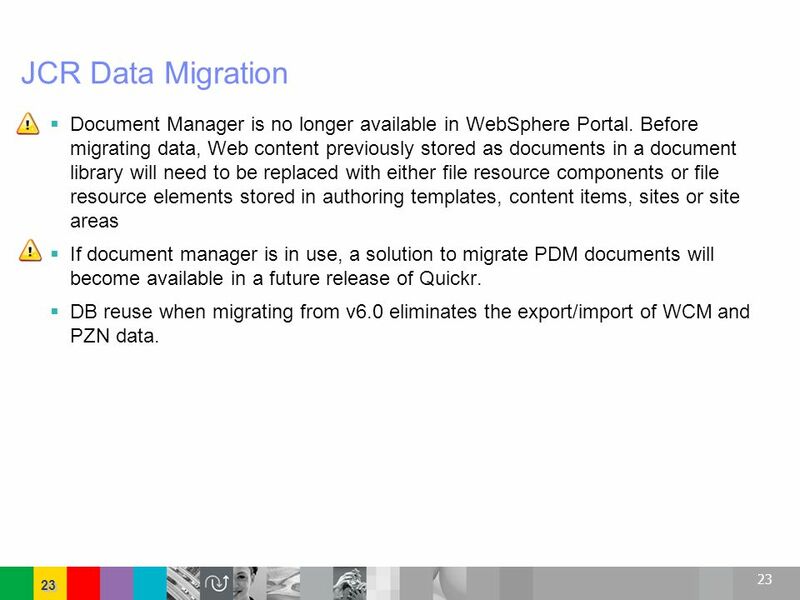 Before migrating data, Web content previously stored as documents in a document library will need to be replaced with either file resource components or file resource elements stored in authoring templates, content items, sites or site areas If document manager is in use, a solution to migrate PDM documents will become available in a future release of Quickr. DB reuse when migrating from v6.0 eliminates the export/import of WCM and PZN data. 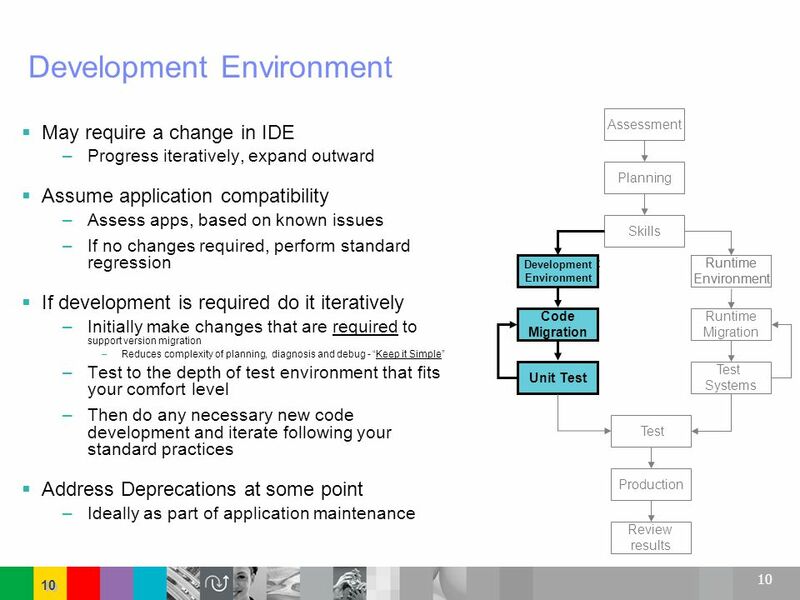 We consider these steps ‘optional’, because they are only run in some environments. For example, run ‘migrate-pdm’ only if using PDM. 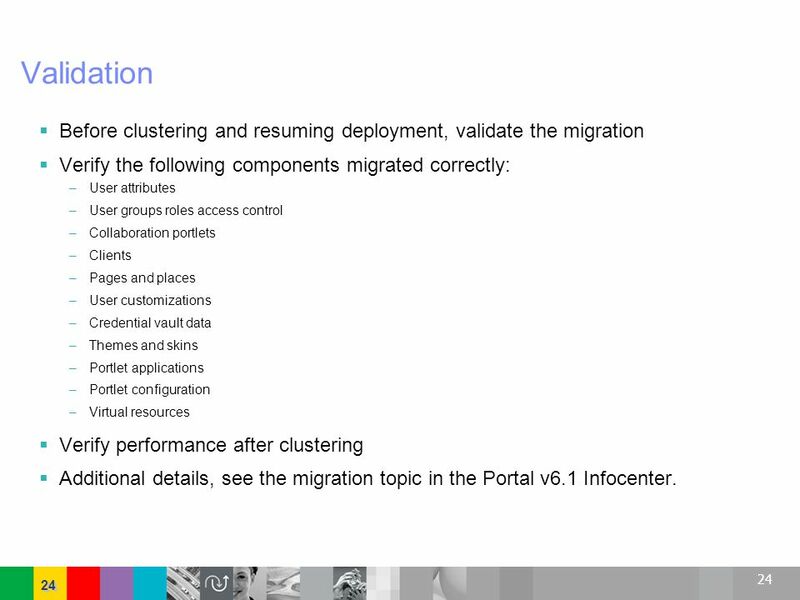 24 Validation Before clustering and resuming deployment, validate the migration Verify the following components migrated correctly: User attributes User groups roles access control Collaboration portlets Clients Pages and places User customizations Credential vault data Themes and skins Portlet applications Portlet configuration Virtual resources Verify performance after clustering Additional details, see the migration topic in the Portal v6.1 Infocenter. 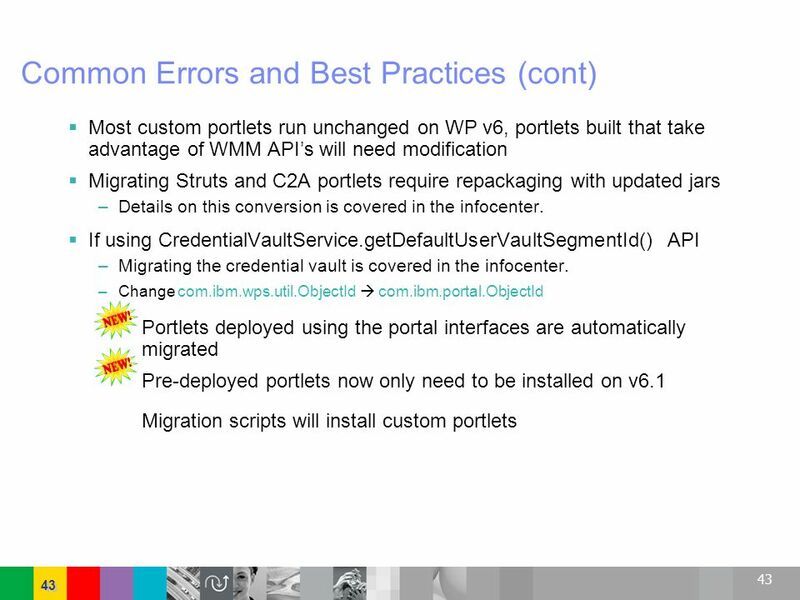 The migration directory is located in <wp_root>/migration Migration plugins live in <wp_root>/migration/components This presentation is just an overview of Portal migration. Spend some time to understand the details. portal-pre-upgrade – Executed against the source server Run using the supplements CD if in a remote migration scenario Run from the v6.1 installed image for same server migration Generates a backup directory which contains the artifacts to move to v6.1 Portal-post-upgrade – Executed against the target server Imports the old configuration into v6.1 Migration is extendable, currently this extensibility framework is not available for customer usage. The documentation and support is not ready for general use. L2 or L3 may provide patches through the extensibility framework. 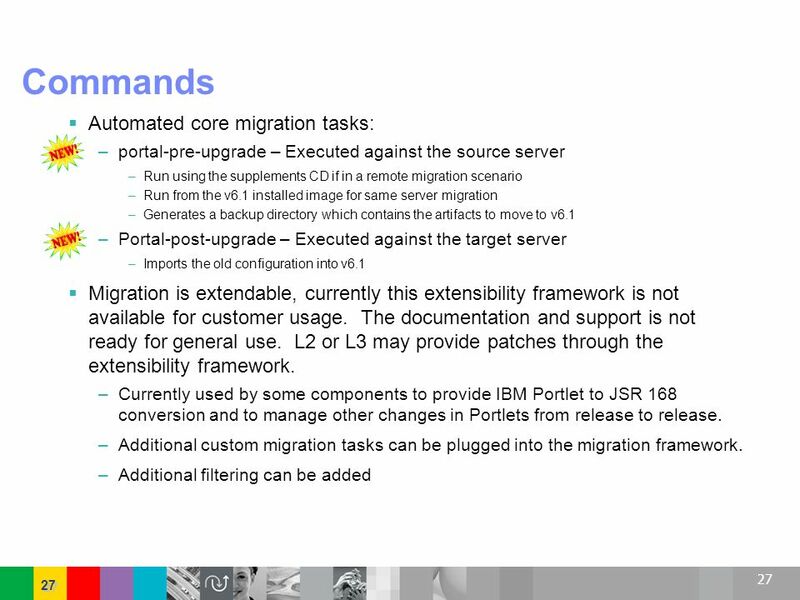 Currently used by some components to provide IBM Portlet to JSR 168 conversion and to manage other changes in Portlets from release to release. Additional custom migration tasks can be plugged into the migration framework. Additional filtering can be added Filters are often needed for Portals with a very large number of pages, to keep the exports manageable. Deployment manager security migration migrate-wmm-to-vmm – Executed on the primary node immediately after federation to restore security. Copy backup dir to DMgr host under the same path where it exists on the primary node update-nodetypes ConfigEngine task Use in the case where a “re-migration” of the JCR data is required Filters are often needed for Portals with a very large number of pages, to keep the exports manageable. Install WCM migration tool ConfigEngine configure-wcm-migration Migrate all the WCM data wcmmigrate all-data Migrate WCM users wcmmigrate users Configure rendering portlets wcmmigrate configure-local wcmmigrate configure-remote Remove the WCM migration tool WPSconfig.bat remove-wcm-migration These are the tasks required to migrate WCM. The tasks require the setup of properties in a properties file as well as the specification of some command line parameters. Those details are beyond the scope of this presentation. 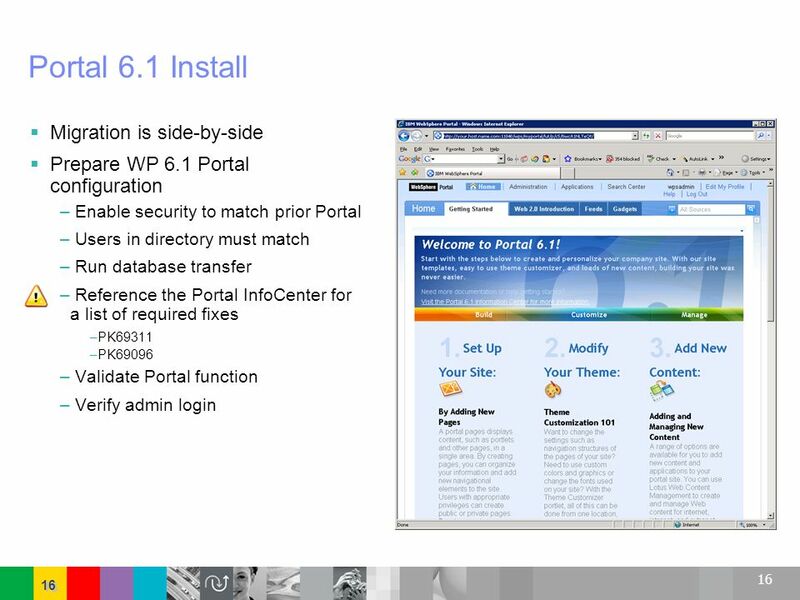 WCM requires a tool be installed into the Portal. After migration this tool should be uninstalled. 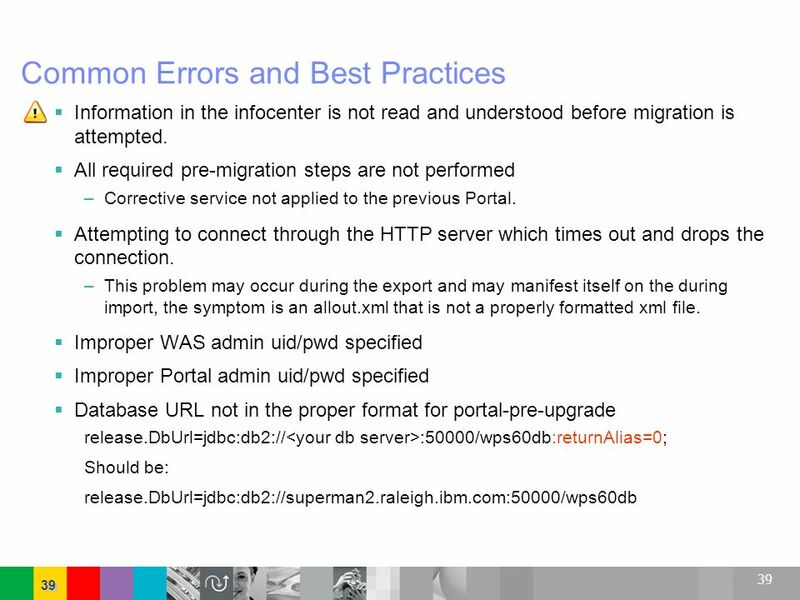 WCM requires the JCR data is migrated first, then the WCM users. 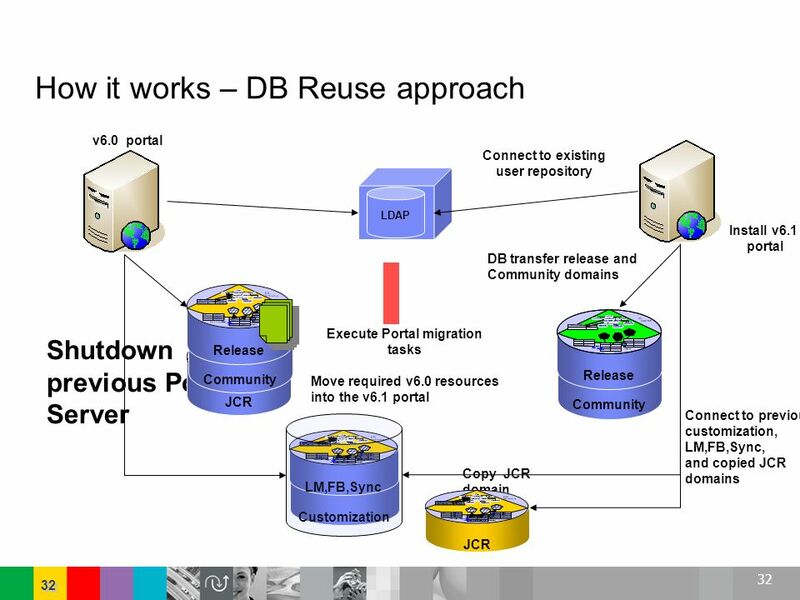 After the JCR data and the user have been migrated the portlets must be configured to render content for the newly migrated data in the JCR. 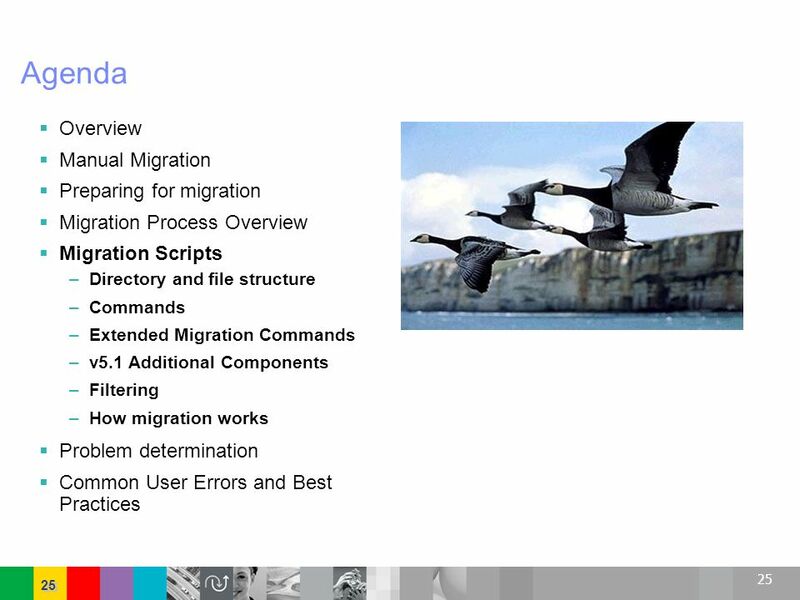 Migrate from 5.1 WPmigrate migrate-pzn-50x WPmigrate migrate-pzn-51x Migrate exported 5.1 data WPmigrate migrate-pzn-svData-transform-51x These are the tasks required to migrate PDM. As you can see the tasks names end in 50x if you are migrating from v5.1 a set of very similar but differently named set of tasks will be used. The tasks essentially export the PDM data and convert it into the format required for import into Portal v6. 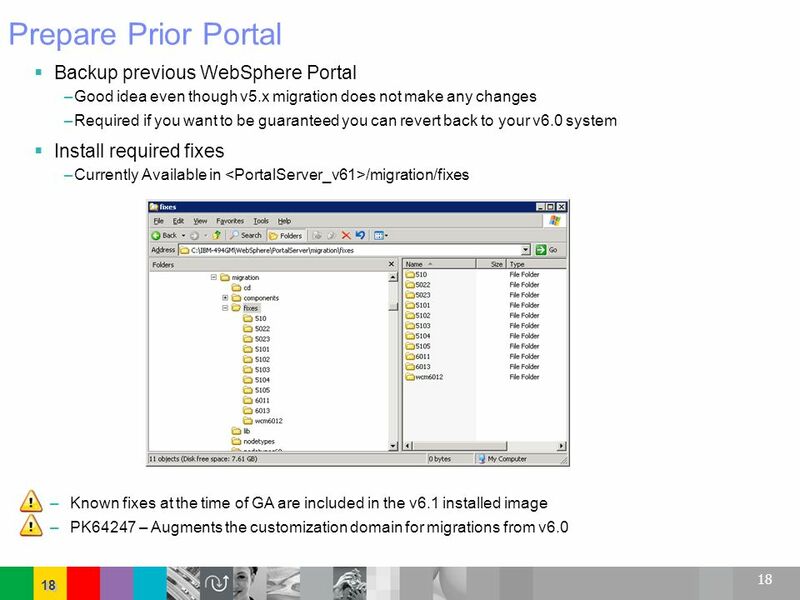 Requires full export and import of all data Very similar to v5.x to v6.0 migration Migration from v6.0 to v6.1 New approach which allows for DB sharing and DB reuse Significantly reduces down time some scenarios can be migrated with zero downtime Filters are often needed for Portals with a very large number of pages, to keep the exports manageable. 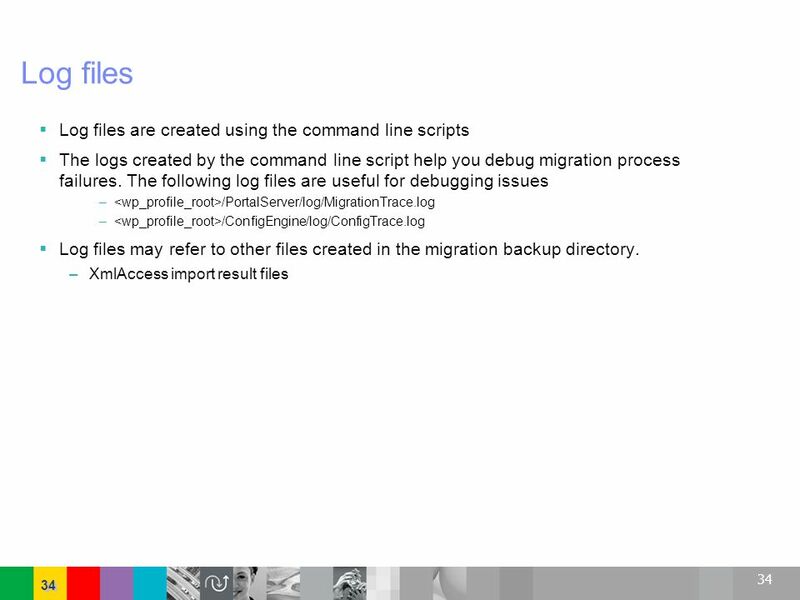 The logs created by the command line script help you debug migration process failures. The following log files are useful for debugging issues <wp_profile_root>/PortalServer/log/MigrationTrace.log <wp_profile_root>/ConfigEngine/log/ConfigTrace.log Log files may refer to other files created in the migration backup directory. 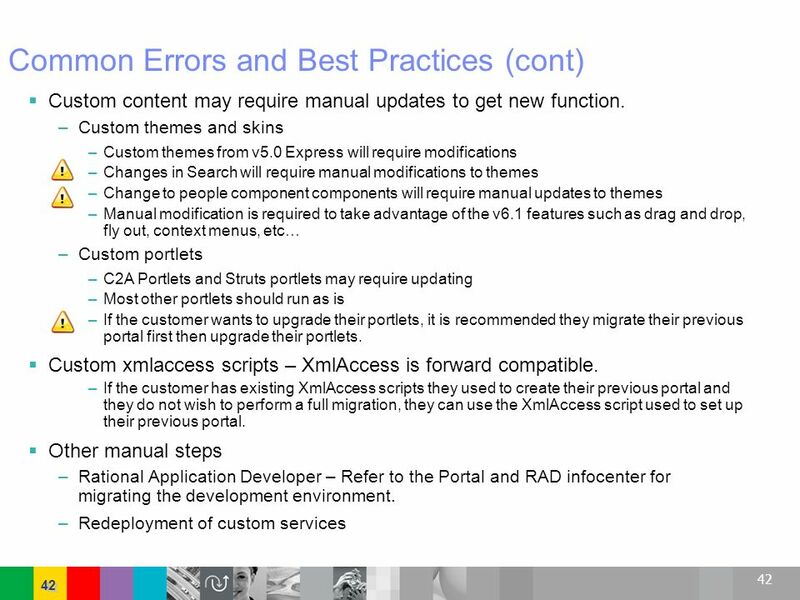 XmlAccess import result files This presentation is just an overview of Portal migration. Spend some time to understand the details. OS OS level Fix packs Portal levels – Including fix pack and iFix levels for previous and v6 Portal Log files: <wp_root>/log/MigrationMessages.log <wp_root>/log/MigrationTrace.log <wp_root>/migrationwizard.log <wp_root>/migrationwizardlog.txt All temporary work files and previous portal information used in the migration process. 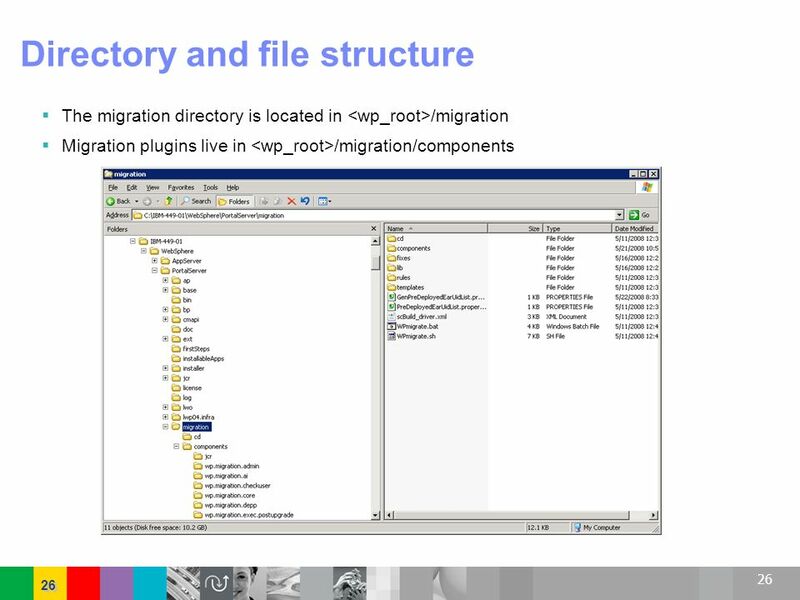 This includes the allout.xml, importAll.xml, template files, previous wpconfig.properties, etc… Instruct the user to zip the Portal backup directory or a subset of the backup directory This presentation is just an overview of Portal migration. Spend some time to understand the details. Manual recreation of all process tasks required if the customer is using WBI. WBI -> WPS conversion is not automatic. Limitation in the WPS product. 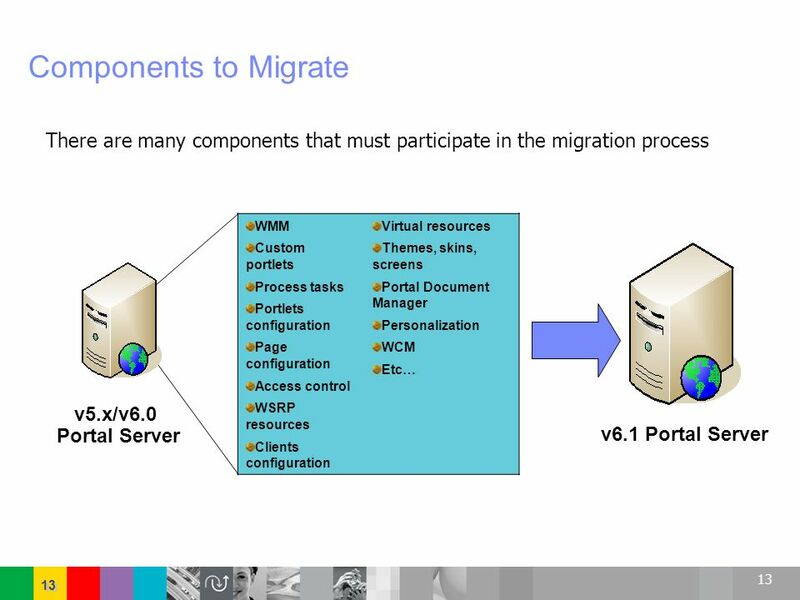 V5.1 Requires a re-write V6.0 If using a local process container the migration complexity is high XmlAccess can not migrate large numbers of users Export requires a significant amount of resources. Admin Portal access control is not migrated. 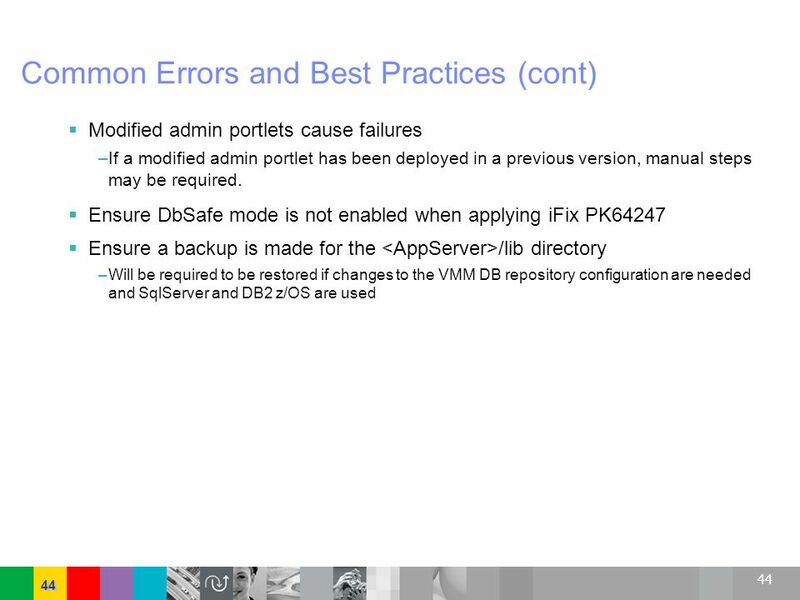 Permissions on default admin portlets must be manually recreated Permissions on clones on non OOB admin pages do get migrated Some cloned admin portlets may require the manual setting of configuration parameters Changes to admin pages must be manually recreated. Includes additional portlets added to pages, themes, skins, etc… Admin page access needs to be recreated as well. v5.10 transformations have been modified, there are manual steps required to fix the transformation. There is no undo, the changes made during the migration process can not be automatically undone, Imperative that the user backs up their initial portal configuration if it is faster than a reinstall. 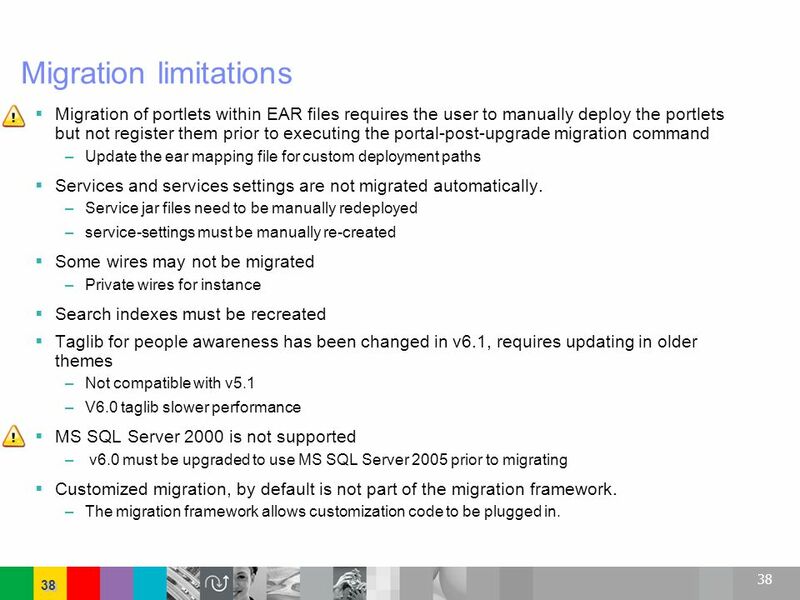 Migration of portlets within EAR files requires the user to manually deploy the portlets but not register them prior to executing the portal-post-upgrade migration command Update the ear mapping file for custom deployment paths Services and services settings are not migrated automatically. Service jar files need to be manually redeployed service-settings must be manually re-created Some wires may not be migrated Private wires for instance Search indexes must be recreated Taglib for people awareness has been changed in v6.1, requires updating in older themes Not compatible with v5.1 V6.0 taglib slower performance MS SQL Server 2000 is not supported v6.0 must be upgraded to use MS SQL Server 2005 prior to migrating Customized migration, by default is not part of the migration framework. 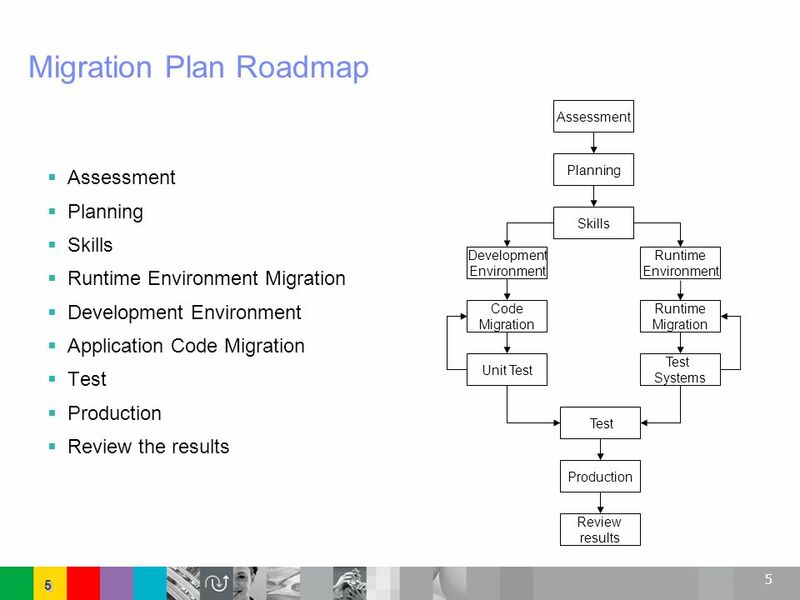 The migration framework allows customization code to be plugged in. Custom content may require manual updates to get new function. Custom themes and skins Custom themes from v5.0 Express will require modifications Changes in Search will require manual modifications to themes Change to people component components will require manual updates to themes Manual modification is required to take advantage of the v6.1 features such as drag and drop, fly out, context menus, etc… Custom portlets C2A Portlets and Struts portlets may require updating Most other portlets should run as is If the customer wants to upgrade their portlets, it is recommended they migrate their previous portal first then upgrade their portlets. Custom xmlaccess scripts – XmlAccess is forward compatible. 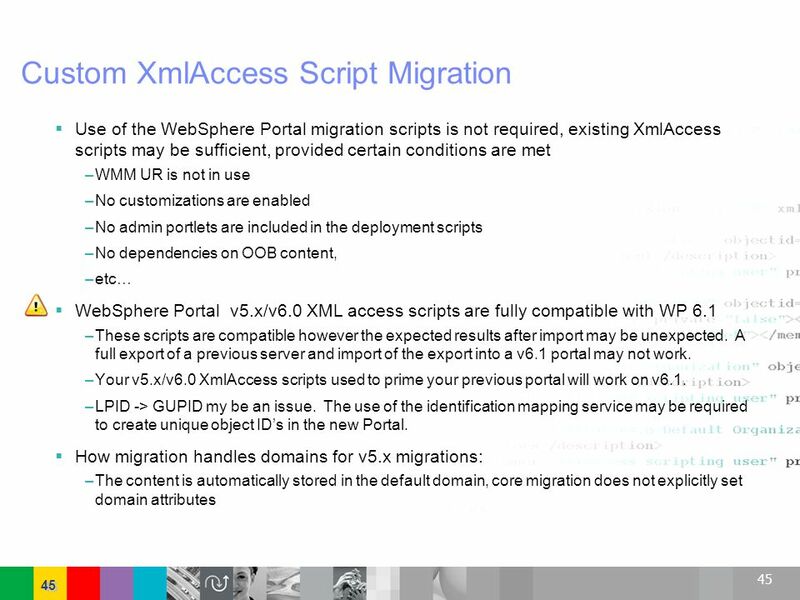 If the customer has existing XmlAccess scripts they used to create their previous portal and they do not wish to perform a full migration, they can use the XmlAccess script used to set up their previous portal. Other manual steps Rational Application Developer – Refer to the Portal and RAD infocenter for migrating the development environment. Redeployment of custom services Custom content is the Portal resources that you develop – mostly custom portlets, themes, and skins. 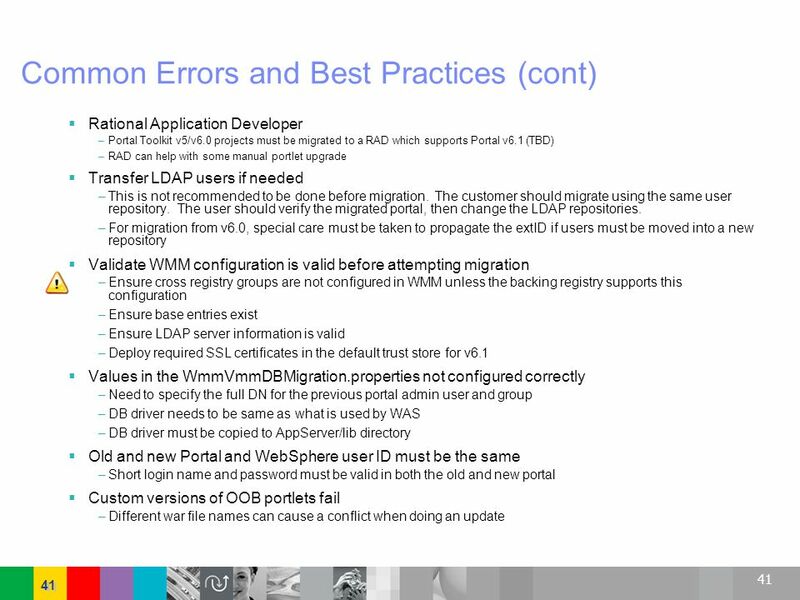 Use of the WebSphere Portal migration scripts is not required, existing XmlAccess scripts may be sufficient, provided certain conditions are met WMM UR is not in use No customizations are enabled No admin portlets are included in the deployment scripts No dependencies on OOB content, etc… WebSphere Portal v5.x/v6.0 XML access scripts are fully compatible with WP 6.1 These scripts are compatible however the expected results after import may be unexpected. 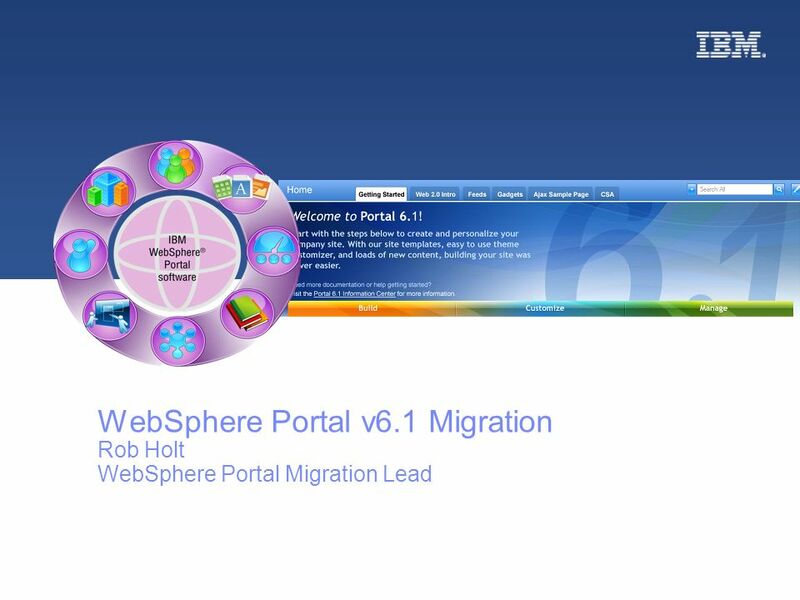 A full export of a previous server and import of the export into a v6.1 portal may not work. Your v5.x/v6.0 XmlAccess scripts used to prime your previous portal will work on v6.1. LPID -> GUPID my be an issue. The use of the identification mapping service may be required to create unique object ID’s in the new Portal. How migration handles domains for v5.x migrations: The content is automatically stored in the default domain, core migration does not explicitly set domain attributes If you have v5.0 xmlaccess scripts, they only need updating if you want to take advantage of new features in v5.1. Download ppt "Agenda Overview Migration Preparing for migration"
8 Copyright © 2005, Oracle. All rights reserved. Creating the Web Tier: JavaServer Pages.